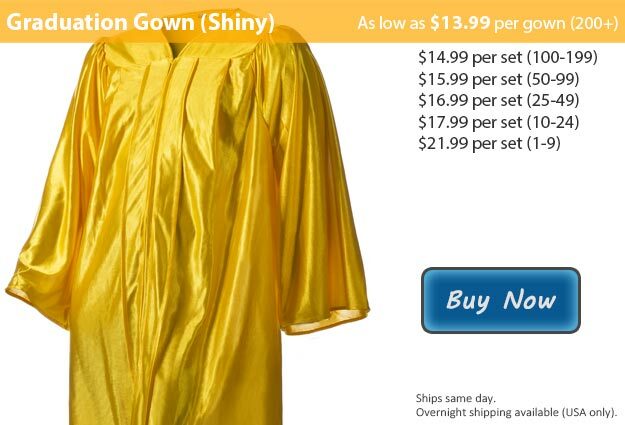 Shiny gold graduation gowns will is the perfect ensemble for entering the next stage of your life! Graduation marks the triumphant completion of one chapter in your life and the very beginning of a whole new adventure. Graduation is a time when your family and friends gather to honor you with a celebration for the years of hard work and dedication that you have went through to make it here. Even though you have put in a huge amount of time and effort to reach this point, I'm sure it was not all challenges. Hopefully you made a couple friends and shared some great memories along the way as well, and thanks to all of your experiences now your know that no matter what your goals are they can be accomplished. Traditionally graduating students wear a cap and gown along with graduation tassels or cords (often both). Our shiny gold graduation gowns are glistening and would be a spectacular way to represent yourself on this memorable day in your life. Available with the matching shiny gold graduation cap, this set looks amazing with any of our graduation cords so you can be sure you will look your absolute best. At Honors Graduation we are here to help you with all of your graduation wardgown wants and needs. Our robes come in a wide range of sizes, from 24 to 66 including several plus sizes. We also have each of our shiny graduation gowns available in matte as well. We have put together package deals for your convenience, anytime you purchase a graduation cap from Honors Graduation we'll throw in the tassels of your choice at no additional fee. Buy your cap and gown separately or in our cap and gown plus tassel bundle which includes your shiny gold gown, matching gold cap, and tassel set of your color choice. Be sure to check out all of our other graduation accessories and gifts! This graduation gown is also available in Gold Matte Fabric.